The FCT Police Command Thursday paraded 25 suspects for their involvement in murder, car snatching, armed robbery and other crimes. The Command also recovered 8 guns, three cars, four motorcycles, seven ammunitions, three knives, one generator and 12 street lights. 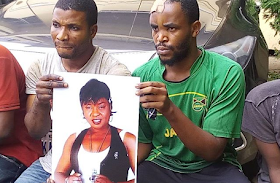 Two of the suspects paraded, Paul Chukwujekwu Ezengo and Emmanuel Adogah were arrested for allegedly killing Ezengo’s married lover in order to own her Acura Jeep. The suspects after giving her excess alcohol, killed her, butchered her body and packed it into two sacks that were later dumped in a river. To cover their trail, the suspects also changed the number plate of the vehicle of the deceased from Abuja number to Ebonyi State number; SKA625AA. The deceased, a 44 year old Charity Chidebere Aiyedogbon mysteriously disappeared in 2016. The Police while narrating efforts made to unravel the mystery behind her disappearance arrested the duo. Giving details of how the suspects were nabbed, the FCT Commissioner of Police, CP Sadiq Bello said: “The dogged determination of the Command to unravel the sudden disappearance of 44yrs old Charity Chidebere Aiyedogbon since May, 2016 has yielded a positive result. “On 1st June, 2018, Police Operatives attached to the Command Anti-Kidnapping Squad succeeded in arresting the principal suspect, one Paul Chukwujekwu Ezengo 27yrs at Benin in Edo State. “Upon his arrest, the principal suspect who has been at large since the lady’s disappearance, confessed during interrogation that the mother of four was his girlfriend and that he conspired with one Emmanuel Adogah 28 years and murdered her on 9th May, 2016 at about 2330hrs at Kagini. “According to Paul Chukwujekwu Ezengo, he gave her excess alcohol to consume before he moved her from Yaoundé Street, Wuse Zone 6 to Kagini area where she was butchered and her mutilated body packaged in two sacks that were later dumped by the river bank at Ushafa, in Bwari Area Council. The Police said they were able to recover the deceased’s car and some of her properties from the suspect. The CP who described Emmanuel Adogah as habitual criminal said he equally confessed to have participated in the commission of the heinous crime. Narrating his involvement with Charity and how he killed her, Ezengo said: “We met on Facebook and she told me she was divorced. I was in a relationship with her for about a year and half. We were having issues in our relationship because I was not benefiting from the relationship. “She wasn’t very rich when I met her but I knew she was comfortable and I needed my own share of her wealth coupled. “Later, evil thoughts came into me that I should kill her and take her car. I proceeded with the thought by involving my friend, Adogah. “We went out to hang out one night in 2016 and while we were there, she had too much alcohol and dozed off. I carried her from the house to where we killed her in Kagini. On why he decided to butcher her, he said: “That night after killing her, I was totally drunk. I wanted to carry her after killing her but she was unable to fit into the sack. That was why I decided to butcher her and dump her body in the river. Other suspects paraded include; Shamsu Tukur, Abdulrahman Haruna, Zakari Bawa, Friday Okpara Ojo Adebisi, Kasimu Isa, Samuel Eze, Kasimu Yakubu, Samaila Muhammed, Musa Yusuf, Abdullahi Ali, Ifeanyi Ugwu. As part of preparation for Sallah celebration, the CP also warned criminal elements not to do anything that will cause breach of peace adding that the Police and other security agencies have taken adequate measures to deal with such individuals or group in order to guarantee absolute peace and security.